Art-based interventions in the community take many forms and can have a powerful impact. How alternative art spaces and creative interventions can empower both individuals and communities will be a focus of the discussion . The panel will highlight some of the initiatives that are taking place in St. Louis and other similar cities. Photograph: Gordon Matta-Clark, Bingo, 1974. The Museum of Modern Art, New York; Nina and Gordon Bunshaft Bequest Fund, Nelson A. Rockefeller Bequest Fund, and the Enid A. Haupt Fund. 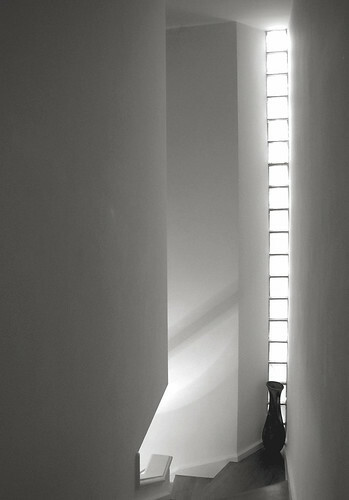 Installation photography © Francois Robert. 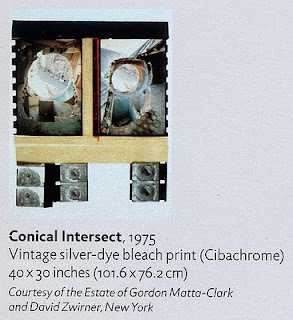 Gordon Matta-Clark works © Estate of Gordon Matta-Clark / Artist Rights Society (ARS), New York. Armstrong's design for this compact cubic white-painted brick house features a surprising vertical slice of glass blocks on the west face of the house. This wall is largely hidden from view on the exterior since it abuts a neighboring house rather closely. The other three exterior walls of the house are largely public and visible since the house is located at the end of a block on a corner, raised up from street level. The consequences of creating this almost arbitrary cut into the brick masonry shell could hardly be more surprising. From the outside, the uninterrupted column of glass blocks spanning the first and second floors suggests the presence of a relatively large space with a high ceiling. In truth, the house contains no such high, open airy space. Rather the slot admits light to the narrow stair beginning at the far side of the living room and climbing steeply toward the center of the house where it is surrounded by sleeping quarters, bathroom and an outdoor terrace. The house's interior isn't particularly flooded with natural light although a grouping of windows at the southwest corner of the living room does admit a healthy dose of light. Nevertheless, the visceral shock of the vertical slash at the stairs is all the more gratifying for being unexpected. 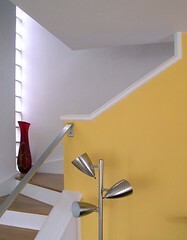 The light admitted in this corner penetrates to the core of the house, lighting and orienting the staircase as a primary organizational feature within the home. 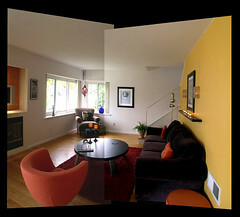 Armstrong's desire to keep the glass blocks clear of any structural or visual interruption from the interior results in some unusual cantilevering of a second floor bedrooom, held up over the point of maximum tension where the stair turns ninety degrees and a support post would normally be encountered. 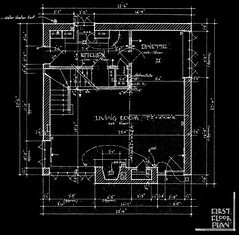 In fact, the original construction drawings for the house (in plan, interior elevations and stair details) Armstrong indicates the use of a round wood post at this location. Perhaps he realized once the framing was underway that the post was not structurally necessary given the rigid framing of the floor diaphram (including 14" and 7" high steel 'I' beams to maintain the open column free areas of the living and dining rooms. Instead, a curious sense of open lightness appears where it would be least expected. Far from being a generic white International Style cube, the house creates a spatial and structural puzzle of interlocking rooms and elements. The use of a simple bent bar of solid aluminum provides just the right contrast, complementing the unusual cut out of the wall and overhanging unsupported ceiling. Photographs by Andrew Raimist. 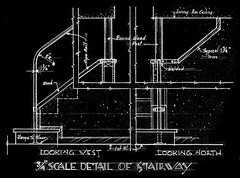 Architectural drawings courtesy of the Harris Armstrong Archives, Special Collections, Washington University in Saint Louis. Armstrong worked with the congregation's building committee to select the fabric for the auditorium seating for the Ethical Society. How the selections were made and how the colors were distributed throughout the very controlled, axial, symmetrical space is rather marvelous. 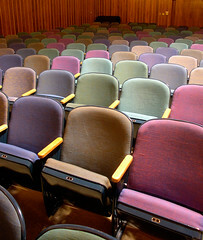 On the one hand, it is a great surprise to the visitor who sees only the painted metal backs of the theater style seating upon entering the space. Only after searching for a place to sit or perhaps upon leaving does a visitor realize the playful use of color and texture. A few years ago when the copper roofing was replaced, a leak damaged the seats and wood finishes. True to their dedication to the building, the membership reinstalled the colorful fabrics according to their original distribution. The current exhibition of Matta-Clark’s work at The Pulitzer Foundation for the Arts has been very thoughtfully and carefully designed and presented. A critical part of this effort involves the printed and on-line graphics. Subtly, yet powerfully, the typographic composition and brochure layout reflect many of the concerns and methods employed by the artist. 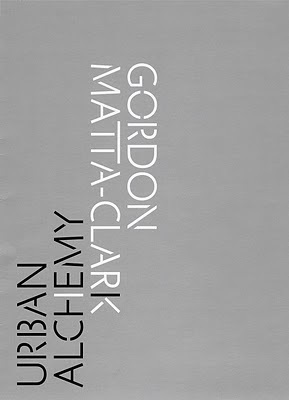 The freely distributed brochure immediately presents the recipient with hints of the kinds of procedures and experiences that are central to Matta-Clark’s practice. The splitting of the all cap text using a modern, simple non-serif font puts his work into a formal context immediately, that is, disruption and alteration of standardized modernist design practice. 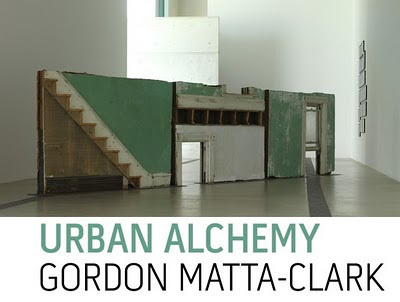 The inversion of 'Urban Alchemy' from 'Gordon Matta-Clark ' creates a sense of uncertainty and imbalance. There is already a degree of unclear sense of proper orientation to the earth and gravity. The slippage of the dark bar of the 'H' in alchemy into the vertical of the 'K' in Matta-Clark suggests the kinds of geometrical slicing and interchange you are about to experience. The inversion of 'Upper' from 'Level' adds a new dimension to the graphic play placing the two sections of upper case text inline, but inverted from one another. If you look carefully, you’ll notice that the cut letters are not consistently altered throughout the headline and caption text. Sometimes E’s are sliced and other times remain whole. Taking these modifications down to the level of the bold titles for the captions reveals the extent of the thought and care of this method. It’s not simply deployed willy-nilly. Rather, the geometry of the project often informs the typographic slices. 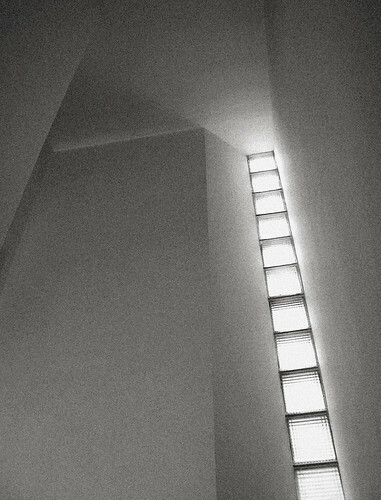 • Day’s End: the slice through the letter ‘y’ relates to the diagonal cutting Matta-Clark inflicted on the end wall. 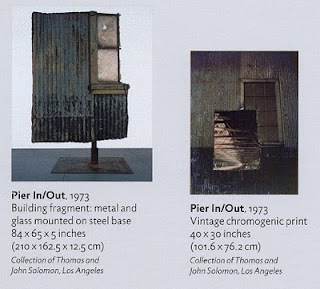 • Pier In/Out: an almost unnoticeable cut in the capital letter ‘P’ reflects the small section taken from a much larger structure. The caption for the image depicting the building from which the section was extracted remains uncut. • Conical Intersect: The slice through the capital letter ‘C’ suggests the creation of a hole through the center of a curved surface which reflects the geometrical relationship of the building fabric and the conical void cut into it. 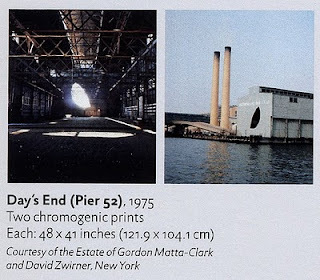 Appropriately, the “Other Works on View” follow the graphic color scheme and fonts used in the rest of the Matta-Clark brochure, but without inversions or cuts in the typography. The folded structure of the brochure in half creating a stiff handout that opens with a central split. As the reader further opens the piece, the overall structure becomes more flexible and malleable. To use it while perusing the gallery the visitor is subconsciously folding and refolding the panels to offer the proper panel in relation to the architectural space in which they’re located. 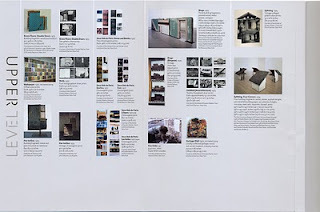 The idea of the parallel presentation of comments from the artist / anarchitect Matta-Clark with a quotation from the building’s architect Tadao Ando reveals a fascination with creating particular sorts of openings in buildings, but the concept doesn’t appear to inform the gallery presentation in an clear and deliberate manner that is immediately obvious to the exhibition viewer (or the brochure reader).